Are you looking forward to enjoying a classic gaming experience that is presented to you by none other than Microgaming? If the answer is yes, then you are in for a treat. This is because this is exactly what Double Magic is, a 3-reeled slot machine that has 1 payline and offers players the classic experience that they are searching for. 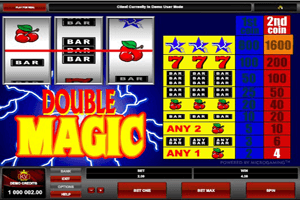 Play Double Magic Slot here. The game’s 3 reels can be found on the left top side of the game’s screen. On them, players will see one middle payline and spinning symbols. These symbols include the blue star symbol, red sevens, bar symbols and cherries. Under the reels, players can find the wagering options that the game has, they include 2 options, the coin number (1 or 2), and the coins’ value. There is also a Max Bet option that placed the maximum wager possible.